20 years ago, four young emcees from Oakland came together as Souls of Mischief and released one of hip-hop’s seminal masterworks, beginning the storied development of trailblazing hip-hop collective Hieroglyphics. As Souls of Mischief celebrates ’93 Til Infinity‘s anniversary, the collective as a whole returns with their first joint project in ten years. The Kitchen, which is available today via iTunes, combines brand new tracks with some selections from the collective members’ respective past works. SPIN, which premiered the project yesterday, cited how the seamless turntablism of Sacramento DJ crew The Sleeprockers compliments Hiero’s who’s who of lyricists: “The continuous blend bumps, grooves, and jitters with soulful loops and acrobatic turntablism, naturally functioning as a perfect platform for the lithe rhymes of the group.” Collective member Casual describes how the artists involved envision the project, musing “This record is a fun release, an audio collage. 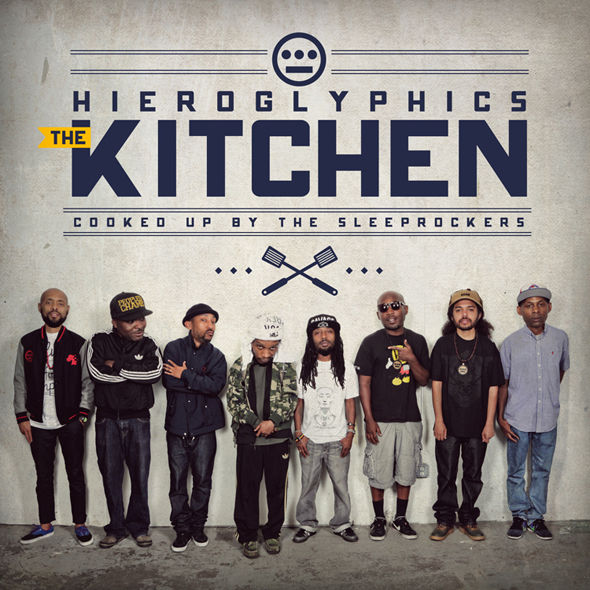 Not much has changed with Hiero.” Hip-hop heads are inclined to agree. Please contact Michelle or Dan if interested in talking with any Hiero Imperium artists. Founded in 1997 in Oakland, CA, Hiero Imperium Records is Del The Funky Homosapien, Casual, Pep Love, Domino, and the Souls of Mischief, made up of A-Plus, Opio, Phesto and Tajai. Coming off waves of success from earlier releases like Souls’ ’93 Til Infinity, the Hiero crew had already established themselves as a name in mainstream and underground hip-hop, and soon released their first collective project Third Eye Vision. Since then the Hiero team has been thriving in the hip-hop world, releasing a number of projects within the label as well as branching out for collaborations with the likes of Jurassic 5, George Clinton, Dilated Peoples, Q-Tip, Xzibit and Gorillaz.